After all the encouraging words that we've read on different fora, Rob Haelterman has expanded the preview of Revell's Jagdpanther with detailed measurements, showing that claims that the kit perfectly scales out to 1/72 are premature. New preview: S-Model Wiesel 1 Mk20, by Bill Scriven. Updated gallery contribution : Jim Gordon placed his Hasegawa Sdkfz 7/1 in a small diorama and took some special effect pictures of it. New preview: Waterloo 1815 German Cavalry WWII (Set 1), by Stephen Brezinski. A Picture has been added to Zedval F-34 gun (72012). A Picture has been added to RB Model D-25T gun (72B09). A Picture has been added to Hauler Wipers (72026) and Padlocks (72030). Updated manufacturer list: MBM Models, to remove erroneous entries for Aircam/Airwar. Pictures and comments added to Retrotracks Belgian Bicycles. Rob Gronovius adds his comments about Dragon's Bergepanther mit Pz.IV turm (#7508). Cpl Overby's Motor Pool will be (temporarily) stopping production and is having a clearance sale. Yesterday we erroneously linked to the old version of Danilo Carli's Dragon Churchill IV review. The link now correctly points to the updated review. TigerDio/HQ72 will be (temporarily) stopping production and is having a clearance sale. Updated review: after receiving more feedback Danilo Carli updates his Dragon Churchill IV review. New previews: S-Model UE Chenillette and M151A2, both by Will Alcott. New Preview: Modell Trans Zusatzpanzerung StuG III, by Rob Haelterman. Pictures have been added to Modell Trans Stryker Wheels. Pictures of the sprues and decals have been added to Academy M1126 Stryker. Updated review : after rechecking the turret of his Dragon Churchill IV, Danilo Carli finds the dimensions wrong and shows us how to correct that problem. Updated Construction Reviews of the S-Model Kfz.13 by Rob Haelterman, including a conversion to the Kfz.14. New Preview: S-Model Pz.Kpfw. Mk.I 202(e) Scout Car, by Rob Haelterman. Pictures and comments added to TP Models Roadside Monuments. Pictures and comments added to Dan Taylor Modelworks REME Set 1. New Construction Reviews: S-Model GAZ-67B, by Rob Haelterman. Updated Construction Reviews of the S-Model Kfz.13, the First to Fight Kfz.13, by Rob Haelterman, including a comparison of both, which shows that one of them is dimensionally impaired. Rob Haelterman starts an article in which all 6 known variants of the Sd.Kfz.234 will be built based on the Hasegawa kits. Rob updates the article about the details of the different Sd.Kfz.234 variants. Pictures and comments added to Hauler Underwear on a Washing Line. Pictures and comments added to Nikolai Oxen team. Pictures and comments added to MIG Productions WWII German Head Set. Pictures and comments added to Germania Figuren's sets GF72-Z004 and GF72-Z005. After more than five years Rob Haelterman finally gets his article covering the uniforms of German soldiers in WW2 online. Rob Haelterman adds pictures and comments to Orion set 72045 (German WW2 Panzer Soldiers). Rob Haelterman adds pictures of Brengun sets 72012, 72016 and 72031. Industry news: Bison Decals has stopped producing decals. Star Decals will be the brand that replaces it. Prodded by Danilo Carli, Rob Haelterman expands the article about the details of the different Sd.Kfz.234 variants. 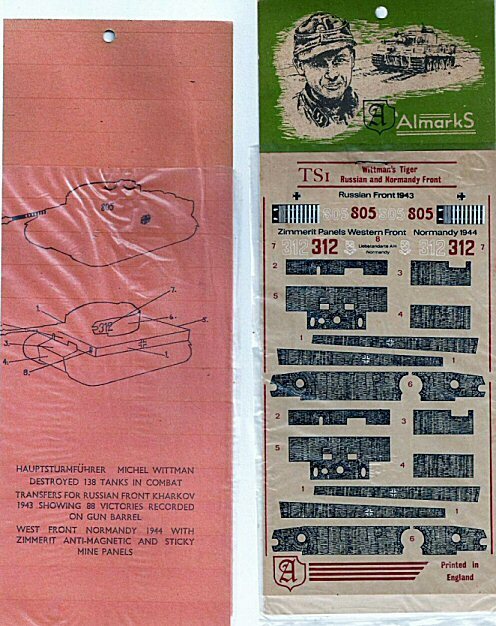 New decal review: Bison Decals US Shermans in Normandy, by Danilo Carli. New Construction Review: Italeri Panther Ausf.G 'Fast Assembly', by Danilo Carli. Rob Haelterman tells about the details of the different Sd.Kfz.234 variants. Rob Haelterman builds a Wespe and two Academy Kübelwagen. Rob Haelterman completely reworks the construction review of the S-Model beute-Hotchkiss H38, now adding kit 72008 as well. New Construction Review: Revell 8.8cm Flak 36, by Al Magnus. Pictures have been added to Military In Detail sets 72001 and 72045, by Rob Haelterman. New preview: RFM Apartment Ruin 05, by Rob Haelterman. New Construction Review: ACE French 25mm Anti-tank gun S.A. Mle 1934, by Dan Taylor. New Preview: RPM Char Mitrailleur FT31, by Rob Haelterman. Pictures have been added to Uschi van der Rosten sets 3003, 3005, 3012, 3013 and 3015. Rob Haelterman compares the 2001 and 2010 releases of Revell's PzKpfw III Ausf. M (kit 03117). Four years after doing his preview, Rob Haelterman finally builds MiniArt's Destroyed Building. Updated manufacturer list: Full Circle Hobbies, to remove items not produced by the company erroneously added in previous updates. Rob Haelterman analyzes the accuracy of the new MK72 Sd.Kfz.250 Ausf. A. Rob Haelterman finishes construction of the new MK72 Sd.Kfz.250 Ausf. A. In the next installment the accuracy will be discussed in detail. New construction review: Dragon PaK 36, by Al Magnus. This is the concluding part of the review of set 7374 containing the 7.5cm PaK 40 & 3.7cm PaK 35/36. Updated list: AER (for Toga 260). Updated list: R2 (13712, 13730). New construction review: Cromwell Knocked out Panzer IV Ausf H (with added parts from Part and RB), by Rob Haelterman. New figure list: Red Box. New figure list: Scibor Monsterous Miniatures. Updated manufacturer list: UM-MT (643,645,646,65001,65002). Updated manufacturer list: ACE (72509). New kit preview: Trumpeter German Sfl.Pz.IVa Dicker Max, by Peter van Kempen. Updated manufacturer list: S-Model (PS720032, PS720093, PS720100). Updated manufacturer list: UM (222). Updated manufacturer list: Steel Models (STM72017, STM72019). Updated manufacturer list: ACE (72519-72521, 72525, 72527, pe_tracks_t55, pe-tracks_t72). New show report for the 2013 IPMS USA Nationals, by Al Magnus. Rob Haelterman finally finds the time to measure the accuracy of the new MK72 Sd.Kfz.250 Ausf. B. Rob Haelterman finishes construction of the new MK72 Sd.Kfz.250 Ausf. B. In the next installment the accuracy will be discussed in detail. New Construction Review: S-Model Dingo Mk.Ia, by Al Magnus. Updated Construction Review: S-Model Kfz.13, by Rob Haelterman. Al Magnus was able to identify one of the "unidentified units". Rob Haelterman continues the build-blog of the new MK72 Sd.Kfz.250 Ausf. B. We just heard that Calibre 35 (and thus Calibre 72) has gone out of business. The staff at On the Way! would like to wish everyone a Happy New Year in 2014.